One more time MR PAUL BLACKFORD drops an other solid project! Following his latest killer album on Binalog Records, PAUL BLACKFORD has just released a new EP on the TUDOR ACID’s imprint : Tudor Beats‘. This ep entitled “Dream Sequence” is a great invitation to float into the galaxy, into this special mood very representative of this producer. 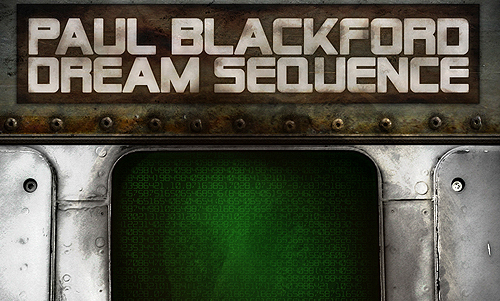 PAUL BLACKFORD’s music is a sweet blend of spacey Electro, melodic (UK) Drum’n’Bass and (Detroit) accelerated Techno. This EP features 2 original tracks and 2 remixes of the title track by SCREWTEC (BlackRed) and TUDOR ACID which are both not bad but a level behind the powerful original. It’ a real pleasure to see PAUL BLACKFORD keeps saving the underground music in its original form : groundbreaking, abstract, timeless, not too cleaned, truthful, fascinating… Recommended!